A light-rail project currently being constructed through Maryland has obtained $120 million in further federal funding, the senators of the Eastern state have announced. 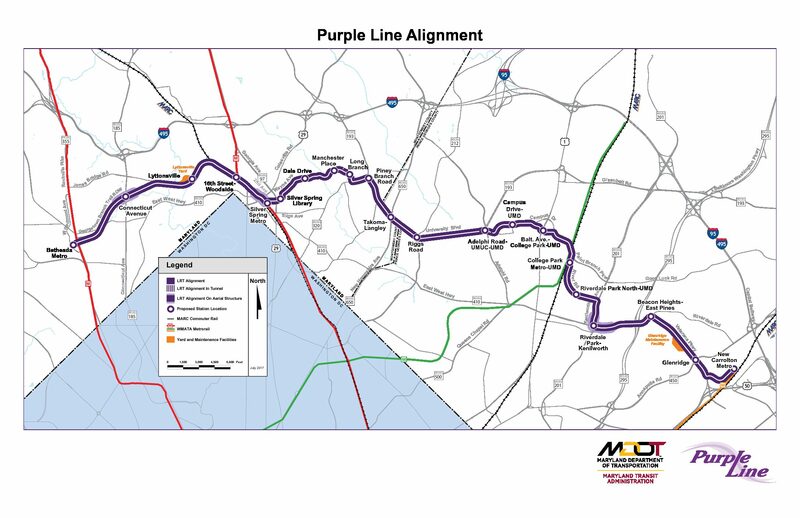 In a press release on March 29, Senators Chris Van Hollen and Ben Cardin, both democrats, said the funding secured through the Federal Transit Administration will help develop railways, stations and storage facilities as part of the 16-mile Maryland Purple Line Light Rail Project. For Van Hollen, it “will ultimately benefit thousands of Marylanders, strengthen our commuter workforce, and boost our economy,” and in addition, for Cardin, “it also will lessen the environmental impacts of traffic” by getting cars off of the roads. The latest grant is part of the $900 million federal funding. More than half of it, a $568 million, has been appropriated through this fiscal year. Once completed, the Purple Line will extend from Bethesda in Montgomery County to New Carrollton in Prince George’s County. It will provide a direct connection to the Metrorail Red, Green and Orange Lines; at Bethesda, Silver Spring, College Park, and New Carrollton. The Purple Line will also connect to MARC, Amtrak, and local bus services. The project includes the completion of the Capital Crescent Trail between Bethesda and Silver Spring, the completion of the Green Trail along Wayne Avenue to Sligo Creek Parkway, and the construction of a bike path through the University of Maryland Campus. Construction began in 2016 and is expected to continue for two more years, with full operations slated for 2022. There will be a short tunnel from Wayne Avenue to Long Branch and 21 stations along its route that will also connect to Metrorail Green and Orange lines and both branches of the Red Line. 69,000 total daily riders are expected by 2030 and another 5,000 to join them over the following decade.